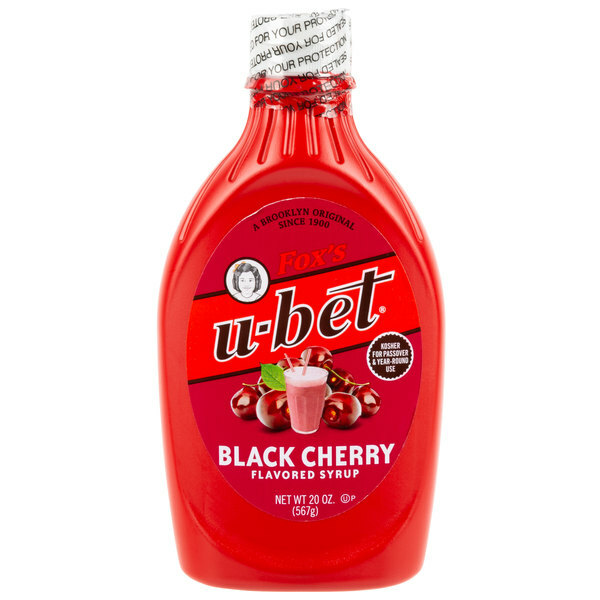 Packaged in a simple-to-use squeeze bottle and bursting with rich, sweet flavor, you can bet on Fox's U-Bet black cherry syrup for great taste. With over one hundred years of manufacturing toppings and flavored syrups, this Brooklyn-based company's tried and true formula for black cherry syrup is sure to please. Use this syrup to create fantastically-flavored ice cream sundaes. Or, make irresistible cherry ice cream sodas with this syrup, a scoop of ice cream, and soda water. Drizzle sweet and summery cherry flavor over brownies, parfaits, funnel cakes, pancakes, waffles, and more! Fox's U-Bet syrup has a smooth, fluid texture and a full-bodied black cherry flavor. The convenient squeeze bottle packaging easily dispenses syrup, while preserving freshness and eliminating hassle from bulk containers. Perfect for your ice cream parlor, bakery, or restaurant, this black cherry syrup is a quick and easy way to enhance the look and fruity flavor of just about any dessert, and it is fat free. For supreme taste and perfectly sweet flavor, trust Fox's U-Bet syrups, like this black cherry syrup, for your sweet treats! Dutch Treat Chopped Vanilla Cookie Base Ice Cream Topping - 10 lb. Chopped Whoppers® Malt Balls Ice Cream Topping - 10 lb. I used this product for the Black Forest cake. I soaked the chocolate sponge with the syrup and it was amazing. All my customers love this product and taste. It give you a hint of the cherry and that’s what you are looking on a Black Forest cake. Love it.. will buy more. Ok, I wanted to bring in some additional depth to some of our flavor combinations, so I decided to try this line of Fox's Syrups. I studied up on the history of them, ad I thought this is worth a try, if these product has been around 100 plus years, maybe I can make it thru another season. This product arrived, I shook it , got a taster spoon, and shoveled it into the sublingual depths of my tastebuds. The Black Cherry, is a thin sauce, that is super blendable , and it is smack your lips and pucker up and smile yummy. The only reservation I have about this product applies to each and every bottle that I received did not have a tamper evident seal, so as result of that, some of them leaked in shipment, fortunately they were secondarily packaged in a plastic bag, so a quick wash up of the bottles exterior brought it back to it's intended state. This has a good flavor. It is though very thin. I had no reason to expect it to be thick but these are as thin as water. I also had my very first and so far only shipping mishap with this product of this flavor even though I've ordered others that were fine. Arrows pointing 'this end up' were on the box. The tops of these were sealed with tape but the cap was loose on just this one. It was within a plastic bag but a little did leak onto other things and unfortunately some of those were items I'd planned to keep in their containers. It wasn't too bad though and I was able to wash everything well. Most of the product remained in the bottle so this will still last awhile. I'm only mentioning it so packaging would be certain to check these. Adding black cherry syrup to your just made soda takes you back to those soda shop days. The taste is more bold than standard cherry syrup. Taste it...you will agree. I don't really like the consistency of these syrups, the black cherry syrup is too runny, not thick like the other brand syrup would traditionally be. Perfect addition to a cherry shake! This, along with a handful of frozen cherries makes a superior menu item that our customers loved. Bottle did leak some during shipping, but was bagged, so no serious damage. Good move for whomever bagged it! Thank you for your review, JEFFREY! We are sorry this Fox's U-Bet 20 oz. Squeeze Bottle Black Cherry Syrup has leaked on you upon delivery. A Customer Solutions Representative will contact you soon! I purchased the Fox black cherry syrup as a try out but the consistency is not what i expected, but it tastes good. Fox can make the syrup a bit thicker. The Fox's U-Bet black cherry syrup is bold and flavorful. A great syrup variation to offer for our ice cream sundaes. The syrup is well priced. Black cherry syrup is not a topping that you will find in many ice cream shops, however it is in all of ours. All of our customers love it and it has became our 4th most requested syrup. This black cherry syrup reminds me of my grandmothers house. Fox's was a staple for black cherry sodas and ice cream floats and this syrup is absolutely fantastic! A surprisingly good syrup. I enjoy this with a nice cold glass of fat free milk. We will offer it to our customers for drinks and sundaes. A little on the runny side, which really limits what we can do with it. We've tried blending it with cherry smoothies and protein shakes, but the taste just isn't there. We recommend if you are looking for a "runnier" syrup that can be blended with other products, but not as a dessert topping. We love this product and use it daily, We are very satisfied with this purchase! We use this amazing product because it looks and taste awesome. Wow amazing. We've never had cherry syrup before but this stuff is amazing on chocolate ice cream. I've also added it to my homemade pop to make cherry cola. The stuff is very thin so I wouldn't really consider it a "syrup". It does have a nice flavor, it's just quite watery. I think it would make an okay mixer for cocktails or other drinks,. This Black Cherry Syrup has a really good taste. I like to use it in my fruit smoothies and to make cherry chocolate almond milk. I haven't tried it yet, but bet it would be good on waffles or pancakes too. All that said, the stuff is simply the best you can get when it comes to flavored syrup, good for baking,ice cream,cake and topping cake. Love the cherry flavor... This flavor isn't easy to find in the store.. Had to give it a try.black cherry milkshakes topped with black cherries yum. An extremely delicious syrup that adds the flavor of Black Cherry to anything it is mixed with. This syrup is great added to milk, protein drinks, and milkshakes. Starting up an icecream shop and threw this on just for fun, well now I am back to re-order in bulk. We are using this alone in milkshakes and also paired with chocolate. Brings a great flavor! This is the first time we try the black cherry flavor syrup. It actually tastes pretty good and the 20 oz is a good size bottle. Good deal. This is such a unique flavor! Fox's Black Cherry Syrup is great with Cherry sorbet! This is a hard to find product but just like many other unique items, Webstaurantstore.com delivers and at such a good price!!! Oh, man. I love anything cherry or cherry flavored. It is a tasty artificial cherry. I love it in milkshakes. I was expecting it to be thick like a sundae topping, but it is closer to the viscosity of water than canola oil. It is very thin. It tastes great. Thank you for your review and we're glad that you like the flavor! While many people use these U-Bet syrups as ice cream toppings, they do indeed have a thinner consistency because they are more designed as flavoring syrups for milkshakes. If you're looking for a thicker topping for ice cream sundaes, we would recommend you give our cherry Fox's 711TOPPING a try! Really hard to find this flavor in the stores, great taste and great price. We use this for shake flavor and makes a really good shake. As a Fox's U-Bet consumer since childhood, I was unaware that there were other Fox's syrup flavors besides chocolate. I can't wait to try them all. Order was shipped promptly and efficiently. 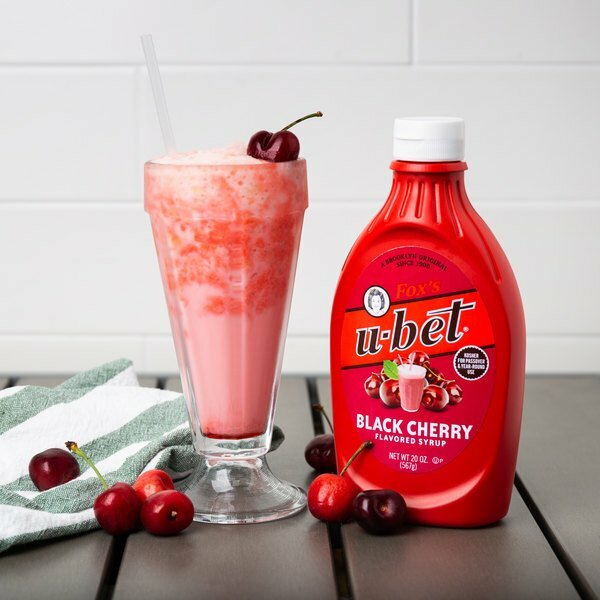 I use the U-Bet Black Cherry syrup with the ice cream that I serve at home. It tastes great and the price is very nice. My favorite combination is the strawberry or mango ice cream and this Black Cherry syrup. I don't use it too much, but a bottle lasts for around 6 months. Everyone in the household loves its great taste and I can't imagine someone who would not like this syrup. Have not tried it yet,but I guarantee I will be ordering more. I ordered a Panera Bread Black Cherry smoothie and it was the BOMB. I can only imagine it with Fox's U-Bet syrup. Oh my gosh. Again,Thank You for your wonderful poducts. And if my wonderful Dad were still around I would be thanking him to for buying me my first Fox's U-Bet chocolate egg cream around 1955-1960 give or take a year. Again,Thank you.